It was in 2007 and I just started working for an oil company in Houston TX. They had all of test/dev in ESX 2.x. The one guy who managed it all showed me vMotion and I was hooked. I managed to get on the “team” as Virtual Infrastructure 3 was being rolled out to production and the company adopted a Virtualization first policy. From there I got my VCP 3 and just read all I could find online and basically decided this technology is where I wanted to focus. To be honest, it started as an ego thing. I thought I knew it all and that I would breeze right through the process. When I got to my first defense in November of 2010 I was handed a serious reality check. After that failure I re-evaluated what I was trying to achieve by obtaining VCDX certification. To me VCDX means you’re in the top of the field for architecting virtualization solutions, you know the platform like the back of your hand and why you would chose to do something one way instead of another, this is what I was missing. From the time I took the VCDX 3 pre tests, enterprise administration and datacenter design (there were no VCAP’s then) till the time I obtained VCDX was close to 2 years. I ended up defending four times before I was successful. I really struggled in the defenses, my designs were good or I wouldn’t have been invited to defend so many times but I struggled with the justification of why I chose one way over the other and once I figured that out and really concentrated on explaining the pros and cons of each way and why it worked for this particular design I was successful. Be prepared for the commitment and sacrifice that goes into a certification like this. This is hands down the hardest thing I’ve done in my 14 year IT career. 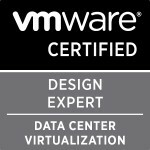 After you’ve passed the VCAP’s and are gearing up to start the VCDX application and design, get the blueprint and read it a few times. Just like with other VMware certifications the information you need to be successful is in there. Remember the journey whether you pass or fail is a great learning experience. And lastly don’t get discouraged, this is a hard certification to obtain and you may not be successful your first time through but remember the experience and improve upon what you just went through and you’ll be that much closer next time. Nothing. Even though I spent close to 2 years trying to obtain this certification, flying across the world for defenses, the experience and knowledge I obtained was worth all the time I invested. Shortly after I obtained my VCDX I took a hard look at the career path I was going down where I was currently working. I was a Senior Virtualization Consultant for a VMware Partner but most of the projects I was working on and saw coming down the pipeline weren’t VMware or even Virtualization focused, they were Cisco UCS/Nexus and NetApp focused. While I love those technologies I really wanted to focus solely on VMware products. In April of 2012 I joined VMware’s Professional Services Organization as a Senior Consultant on the Cloud Infrastructure and Management team. My first official job was to go to Toronto to be a VCDX panelist which was awesome and a relief to be sitting on the other side of the table. I love my job and while I could have joined this team without a VCDX, it certainly helped having it so yes it was definitely worth it. Categories: Certifications, VCAP, VCDX | Tags: VCAP, VCDX, VCDX4, VCDX5, VMware | Permalink. Very good advice Mike! Nice write up. Great BIO Mike. It’s always interesting to me to look at one’s career path and discovering how they arrived in the land of VMware virtualization. Pingback: My VCDX Spotlight is up! Nice, very succinct. To be honest, we were already using it in production on the Citrix platform when you got there for old applications. You were already big into virtualization, Citrix! I see you have come far and it looks good on you.